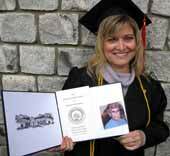 REDDING, Calif. – On Saturday, Jan. 23, Weaverville resident Tanya Menezes Cooper fulfilled her goal of earning a college degree. The 46-year old mother of four graduated with a Bachelor of Arts in Organizational Leadership from Simpson’s Adult Studies ASPIRE program. Her 4.0 grade-point average made her eligible for Alpha Sigma Lambda, a national honor society for students who receive a GPA of 3.8 or higher. Cooper was among 156 graduates at Simpson’s winter commencement. The Adult Studies program graduated 126 students, making it the largest graduating class in ASPIRE’s 21-year history. Simpson’s traditional undergraduate program graduated 17 students, while 13 earned their master’s degrees. 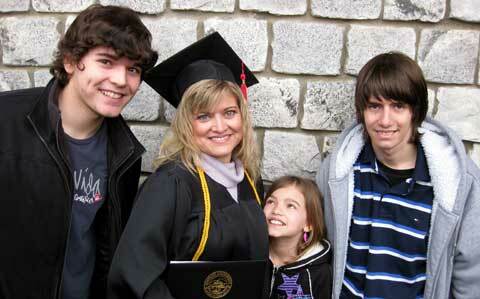 In 2008, with only two of her kids still living at home and one getting ready to go off to college, the single mother realized that she was at a point in her life where it was a good time to finish her degree. “I got married at an early age and had children, so I wasn’t able to dedicate the time to continuing my education back then,” said Cooper. that she was at a point in her life where it was a good time to finish her degree. Wanting to begin a career in marriage and family therapy, Cooper recognized the importance of earning her degree. Cooper’s family also played a role in her decision to return to school. The 16 months in the ASPIRE program were not easy for Cooper. Just two weeks into the program her dad passed away. The Organizational Leadership classes met every other Saturday, allowing Cooper to keep her part-time job at CVS in Weaverville. While balancing homework, a job and a family wasn’t easy, she came up with a system that worked for her. In the crowd of over 1,000 people, Cooper had her kids, best friend and mom watch her as she crossed the stage to receive her diploma. “I carried a photo of my dad with me the whole time. I know he’d be really proud of me,” she said. Cooper is continuing her education by earning a master’s in marriage and family therapy and plans to become a counselor for women and adolescents.